In this section, only the early to middle Saxon pottery is discussed. The later material is considered in the analysis of the Medieval period. Figure 3.24. Distribution of early to middle Anglo-Saxon pottery. The limits of the urban development of Margidunum are shown. Note that two sherds of Anglo-Saxon pottery appear to lie within them. The most northerly of the scatters is around Margidunum in fields 0111, 0412, 0710, 9809 and 0710 (Figure 1.1). These include sandstone tempered, Charnwood-type and Trent sandstone-tempered fabrics, which together fall in the date range from 450-800 AD. The second area is around the two Romano-British clusters near Lower Brackendale Farm buildings, in fields 9278, 8982 and 9676. Again, there are Charnwood-type and sandstone-tempered fabrics present. Field 9278 also has a strong Iron Age collection. The third of these is in field 2383, where two sherds of sandstone-tempered wares dated AD 550-800 were found close to the site of the double-ditched Romano-British enclosure. Field 2491, which is at the junction of Granby Lane and the A52 has no Anglo-Saxon pottery, though it is close to field 1690 in which an Anglo-Saxon cremation cemetery was located and field walked by Alvey (1980). However, the survey of field 2890, which is to the east of 2491 and outside the parish, in November 2008 yielded three early to middle Anglo-Saxon sandstone-tempered sherds. With the possible exception of the Lower Brackendale occurrence in field 9278, the scatters of early to middle Anglo-Saxon pottery sherds are not dense and there are no clear indications that they are marking the sites of homesteads or the infields around settlements. Jones (2004) in his study of Whittlewood says that sherds of Anglo-Saxon pottery are likely to be found in both environments. 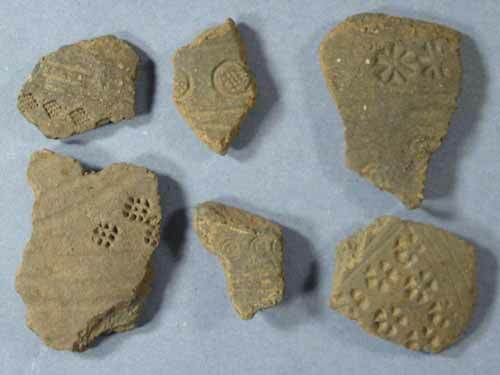 Anglo-Saxon pottery is very fragile and does not survive for long when exposed at the surface of the plough soil. The presence of so many sherds recorded in these areas, which have been ploughed for centuries, probably indicates that there is a considerable amount of it at depth and it seems reasonable to suggest that these scatters do mark the sites of settlements. At Margidunum and Granby Lane the Anglo-Saxon scatters are close by the high-density concentrations of Roman and Iron Age pottery sherds. At Starnhill there is only a single Iron Age sherd in the double-ditched enclosure, which may or may not indicate an Iron Age origin for the settlement there. The bulk of the dated sherds at this site are 3rd-4th century Roman pottery. At Lower Brackendale one small field, 9278, contains clusters of Iron Age, Roman and Anglo-Saxon pottery, but the scatter of Anglo-Saxon sherds is over a much wider area than for either of the two earlier periods. Even taking account of the possible effects of solifluction and redistribution of sherds during agricultural processes it is evident that the Anglo-Saxon scatters are not all in the same place as the high density Roman scatters, but are mostly adjacent to them. This seems to indicate some degree of settlement drift within a limited area over time, rather than in situ redevelopment. It may be significant that Margidunum, Granby Lane and Starnhill are the three biggest Roman or Roman influenced settlements in the area of the parish. Lower Brackendale, while it has only two small clusters of Roman pottery, has roots in the Iron Age. The precision of dating of the Iron Age and Anglo-Saxon fabric types using field-walked finds is not close enough to be sure of continuity of occupation at these places. The Roman pottery, while better dated, shows a widespread dearth of late 4th and early 5th century material. Pottery from this period has only been found close to the defended town centre of Margidunum and at the double-ditched enclosure at Starnhill, where a single piece of Oxfordshire Ware was found. The significance of this is not clear, but it may reflect a change to the worse in the economic environment during the late decades of the Roman occupation rather than discontinuity of occupation. It also may be significant that it is only these sites with a long history of possible occupation that provide evidence of Anglo-Saxon activity. Several of the clusters of Roman pottery (see Figure 3.14) thought to be sites of small farms in Roman times, such as fields 1803, 1289, 0082 and 0179 have neither Iron Age nor Anglo-Saxon pottery. This might reflect on the transitory nature of these small farms. They appeared as a result of change in farming from stock rearing to arable during the Roman period, but did not survive the economic down-turn in the late 4th century. 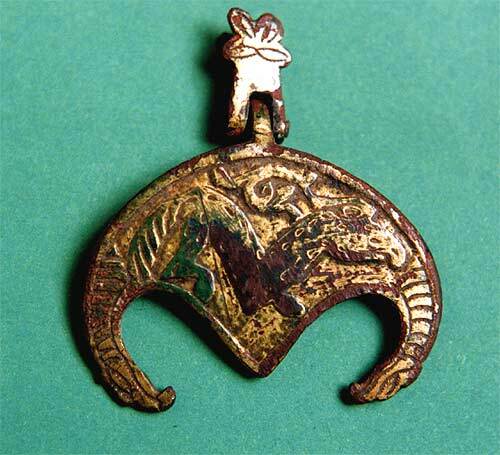 Gilt-bronze pendant found in Margidunum, is possibly from a horse harness. It is more Romano-British than Germanic in design and has been attributed to the fifth century (Nottingham University Museum. Photo: R. J. A. Wilson). There is other evidence for an Anglo-Saxon presence at Margidunum. A gilt-bronze pendant (pictured above) found by Todd (1969) is thought possibly to be a horse harness decoration. Todd attributes the pendant, which was in unstratified deposits, to the second half of the fifth century, but there is some debate about the artistic origins of its style. Kinsley (in the BHTA leaflet Anglo-Saxon & Medieval Bingham) writes that the motifs and techniques employed in it are more Roman than Germanic, suggesting either an earlier date for the pendant or that there was a continuation of Roman art styles through this period among a surviving local population. Todd (1969), however, did find small amounts of unstratified Anglo-Saxon pottery in his excavations at Margidunum and an Anglo-Saxon bronze brooch (pictured below) had been recovered on the surface of the site in the late nineteenth century. (See the BHTA website for an illustration and details). All of this seems to suggest that there was continuity of occupation from the Roman into the Anglo-Saxon periods at Margidunum. Bronze brooch found at Margidunum. The iron pin has corroded away. Height 6.7 cm; side view to the left. Original drawing by W.R.Gleave in 1909. Redrawn by G. Kinsley. Field walking did not substantiate the discovery of an Anglo-Saxon cremation cemetery found in field 1690 (Figure 1.1) by Alvey (1980). Anglo-Saxon pottery is notoriously fragile. It does not survive long in the soil at the surface and Alvey himself failed to find any traces of pottery or bone when revisiting the site. The cemetery is about 1 km from finds of Anglo-Saxon pottery in the Granby Lane site and from the double-ditched enclosure on Starnhill. Alvey does not give any indication of the size of the cemetery in any published account and he did not attempt to date the pottery (pictured below) he recovered, so there is no indication whether it served only the nearest Anglo-Saxon communities or all of them within the area of the parish. 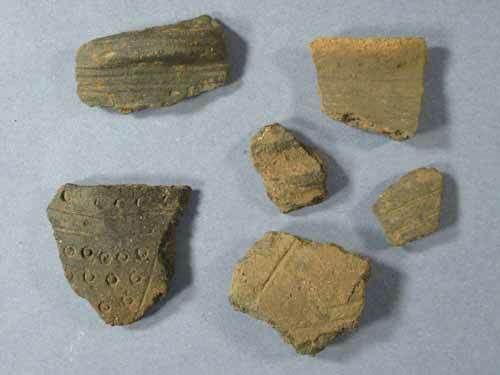 These small sherds, collected by Trent & Peak Archaeological Unit from the surface of fields in the parish are the tantalising evidence for Anglo-Saxon occupation in Bingham. These are from hand-made urns decorated with applied cordons and bosses or by impressing stamps made from bones and other materials. The stamped decoration on these Anglo-Saxon sherds is fairly elaborate. Quite complex stamps have been made to enhance the urns. These were collected by Trent & Peak Archaeological Unit from the surface of fields in the parish. No Anglo-Saxon pottery finds were collected in the fields immediately adjacent to the Moothouse Pit just besides the Fosse Way. The nearest is the single piece of sandstone-tempered ware found about 800 metres away in field 9287. Writing in 1677, Dr Thoroton states that the Moothouse Pit was the meeting place of the Bingham Wapentake. There are other similar pits to the west, all in similar geology and it is possible that they are marl pits. There is no evidence of when they were dug except that the Moothouse Pit was there prior to 1677. The significance of the pit is primarily in its name. It is thought that the name Moothouse is derived from Motehowes where mote for meeting place becomes moot. Howes, which becomes house, is derived from the Old Norse haugr, meaning a hill or mound. Moothouse could, therefore, be interpreted as referring to a meeting place near a mound. Motehowes, which is an unlocated place name, appears in a manuscript dated 1375 (see Gover, Mawer and Stenton, 1979) and it is possible that the mound is the one described as a tumulus (pictured below) by Stukeley (1726) and interpreted as a possible Anglo-Saxon burial site. The site is a local topographic high point with views for many miles all around. The absence of any evidence in Bingham parish of an Anglo-Saxon settlement close by may not be significant if the burial site had been chosen with the topography in mind. Stukeley drew the mound as though it were on the Fosse Way, which may imply a disregard of the importance of that road by the Anglo-Saxons. Bingham from the Fosse Way. Tumulus drawn in 1722 by William Stukeley. From an engraving in Itinerarium Curiosum. No Anglo-Saxon pottery sherds were picked up on Parson’s Hill, which is believed to be where an Anglo-Saxon inhumation grave containing a skeleton with a sword and shield boss was excavated in 1863 (Meaney, 1964). The solitary find in field 0507, however, is within about 500 metres of a possible site for the grave. Parson’s Hill has been a place occupied since the Iron Age and is as good a candidate for Anglo-Saxon occupation as Granby Lane, Margidunum, Starnhill and Lower Brackendale. The explanation for the lack of evidence here is possibly down to agricultural practice. The site is on Holme Farm, which has been arable since the 1960s, but for most of that time has not been ploughed. Instead, the farmer uses a cultivator, which works only the top few inches of soil. Any fragile pottery in the soil would long ago have been fragmented by such annual attrition and nothing new would have been brought to the surface. Finally, the name Bingham itself is thought to have an Anglo-Saxon origin, being a contraction of Bynnaingham, meaning the place (ham) of the people (ing) of Bynna. There is no information at all about the Anglo-Saxon history of the current built-up area of Bingham, but outside it, field walking shows that there were probably Anglo-Saxon settlements at Margidunum, Lower Brackendale, Granby Lane and Starnhill. The lack of Anglo-Saxon pottery sherds on Parson’s Hill, which has a similar Iron Age and Roman history to the other four sites, can possibly be attributed to agricultural practices, rather than an absence of Anglo-Saxon occupation. Thus, it is reasonable to suggest that there were five Anglo-Saxon communities dispersed around the area of Bingham parish, all in places with a long prior history of occupation. None of the small farms postulated to have been newly established, mainly in the southern half of the parish, during the Roman occupation appear to have survived the 4th century. An intriguing question to arise from this analysis is whether it was one of these five communities or another, as yet unknown one, based under Bingham town centre that gave Bingham its name. Some archaeologists have begun to question the idea of a massive Anglo-Saxon invasion in the 5th and 6th century Migration Period. Pryor (2004) rehearses the arguments against an invasion and points out that in no excavated site has evidence been found of discontinuity between the Romano-British and Anglo-Saxon occupation. His conclusion is that the changes in pottery style were more the result of cultural changes rather than changes of people. To what extent this conclusion can be supported by an analysis of field walked finds is debateable, but the coincidence of scatters of Anglo-Saxon pottery with clusters of Iron Age and Roman pottery in Bingham parish is possibly relevant to this argument. The actual distribution of the Anglo-Saxon sherds, in most places, puts them adjacent to the older material, though at Lower Brackendale sherds from all three periods are found in one small field. The inference from this distribution is that there was a certain amount of settlement drift over time, but with the communities essentially constrained within their own small areas. There is no evidence anywhere in the parish that the Anglo-Saxons built new settlements that were at a distance from existing Romano-British ones.